To be short and to the point: yes, oolong tea and wu yi tea are the one and the same. They’re both the same type of tea. The reason that they have different names and different spellings is because of the language translation. There were two different systems used to translate Mandarin into English. One of these systems used Chinese characters and not letters; one is called the Wades Giles and the other is called the Pinyin system for translation. When translating with the Wade Giles system, the pronunciation of the first character is “Oo”, but with the Pinyin translation system the first sound is “Wu.” Together, it’s oo-long-cha and/or wu-long cha which means Oolong tea and/or Wu long tea. Additionally, some people have called this brown tea or rock tea. 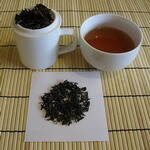 Oolong – or Wu Yi – tea is a cross between green tea and black tea, according to some. The leaves aren’t as fully oxidized as black tea is, but they are fermented longer than greed tea typically is. This creates an entirely new and different type of tea that has a new and different taste and effect. Wu Long tea can be varied, but it is mostly produced in the China and Taiwan region, particularly in the Wu Yi mountain area. Essentially, Wu Yi tea and oolong tea are the one and the same. They’re the same product and the same type of tea; the only true difference was the way that the name of the tea was translated. Oolong Tea tea has a caffeine content between that of green teas and black teas. The flavor is typically not as robust as black tea or as subtle as green tea, but has its own fragrant subtleties. It can be compared to the taste and aroma of fresh flowers or fruit. Wu-yi Tea / Oolong Tea contain a large amount of polyphenols. It appears that the health benefit of either tea is the effect of polyphenols. Since both teas contain large amounts of polyphenols, they may have antioxidant, anticancer, and antiviral properties, as well as regulating appetite and weight loss.